Back in January, I've been thinking of putting a new monthly post highlighting about my favorite products or items of the month. I noticed that the beauty gurus on Youtube does this every month and I love knowing their fave products so I know which one really works and which ones to try. So based on that experience, I thought I'd also try to share my favorite monthly products, beauty wise. This would include skincare, bodycare, and/or makeup. I would try to put the post up right after the month is over, for example: for January favorites I would put the post on early February, and so on.. Contains Rose-petal water, un-distilled Witch Hazel extract, Certified Organic Aloe Vera, and Vitamin E. This toner helps to tighten pores, and to smooth and beautify skin without drying. The benefits: Rose hips are a rich source of omega-3 and omega-6 fatty acids, vitamin C, A, D and E, and antioxidant flavonoids which helps reduce the appearance of scars, fine lines and restoring the skin's moisture balance. Hibiscus is known for its ability to cleanse, tone and balance the skins delicate PH as well as moisturizing skin. I was skeptical at first whether this serum would do wonder, but surprisingly it does! When I received it in the mail for review purposes I put it on religiously every night (and sometimes in the morning too) after cleansing and before night cream / moisturizer. I did it so I can give good reviews for you guys (you can read my full review here). And then I always thought that it would take a longer period of time to see if a serum is successful or not, but after only using this for a month, surprisingly my husband told me a couple of days ago, that he notices the smile line around my lips are not there anymore. And that my skin is smoother and no visible lines whatsoever. (I don't have wrinkles yet, but when my skin is dry you can see very very thin lines on my smile line, I guess it's from smiling too much ;p - Oh and also a little bit on my forehead, maybe because I frowned a lot ;p). So anyway, hubby notices that the thin lines are not there anymore, and I credit that to this serum! 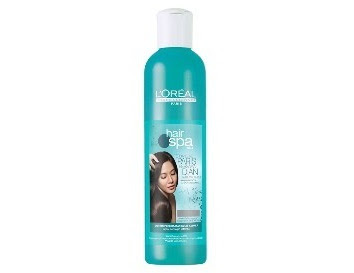 Part of the Sensory System, this L'oreal Spa Energizing Scalp Lotion is a blend of energizing formula based on purified water and piroctone olamie that helps to fight dandruff. It leaves hair light, shiny and easy to style. I LOVE this product! I used to have occasional dry flakes on my hair as a result of itchy scalp that usually caused by either I'm over-stressed or a very hot/humid weather or a combination of both. I'd like to call the condition as "stress-induced dandruff". I'll tell you about my hair regimen that finally got rid of the stress-induced dandruff in another post, but in the meantime this particular product is definitely an important part of that regimen! Putting this on my scalp and massaging it after a hair-wash really got rid of the itchy feeling on the scalp, it also made my scalp feels fresh with a little bit tingly feeling like I put on some mint on it, very refreshing! And the best part is: it works! So if you have itchy scalp, I recommend using this with anti-dandruff shampoo. 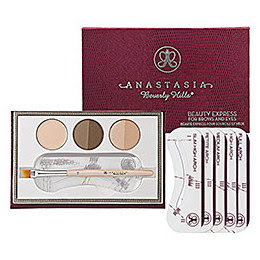 The portable kit contains Brow Powder Duo, Brow Wax, a variety of Stencils, and an Angled Brow Brush with a mirror and instructions, all in one convenient kit. Anastasia is the Hollywood's brow master, she is a brow expert that has shaped the brows of the Hollywood's elites such as Madonna, J-Lo, Selena Gomez, Oprah, etc.. Ever since I found out about filling brows with brow powder instead of using brow pencils I am hooked with it! Using brow powder needs a little bit more time but it sure does give you a more natural look than if you use pencils, and it stays for a longer time too! This kit has been my HG (=holly grail) and I love using it because the result is very natural, it's so easy to use, everything I need is in one practical palette that I can bring inside my makeup bag everyday, and it also include a wax that made it stays even longer. Love it! - You can read my full review here. This hair conditioner is a product from Indonesian premium brand Taman Sari Royal Heritage. It's a hair care product that helps to gain a soft, shiny and easily-combed hair. Made of selected coconut milk, added with aromatic citrus plus vitamin E for healthy hair. I've spent the last years trying on different hair conditioners that will work with my hair type and will leave trails of fragrant that lasts. And after trying a sample size of this conditioner I'm kinda hooked with it. I love the subtle sweet scent of coconut citrus blend, and I love how the scent actually lingers for a little while. Well it does not last that long though, but it sure does lasts for a few more hours after I washed my hair, other brands usually just lasts for a couple hour and wouldn't make it through half day. I also love that this conditioner has tiny granules on it which is actually vitamin E beads. What I usually do is I leave it on in my hair for 5 minutes or more, so that the fragrance will last longer. But you need a lot of this product in one lather to cover all of your hair because the texture is easily emulsified and your hair will easily absorb it so you need to re-lather for a couple of times in order to fully covered all parts of your hair. This means: the product will quickly run out. This lotion was created with pure flower extracts, essential oils and nourishing botanicals. It deeply soothes, hydrate, and delicately scent the skin with night-time jasmine flowers. It's a honey-based lotion with wild crafted botanicals and essential oils of tangerine, jasmine sambac, ylang ylang and neroli, enriched with neem extract to heal and purify, rich in vitamin and almond oil to deeply soften and nourish the skin. At first, when I read the name I was afraid that the jasmine scent would be a little bit over-powering as what I experienced before from jasmine-infused products. (Sebenernya sih saya takut dibilang kaya Suzanna kalo bau nya "terlalu melati banget" hehehe ;p). But it turns out that this lotion is not like that at all. Maybe because the scent is not purely jasmine, it is a blend of jasmine extracts with other essential oils of tangerine, ylang ylang, etc.. so the scent is actually quite nice. And what I love most is how the scent is on the subtle side but somehow it makes you smells good all over. And I also love the texture of the lotion which is easily absorbed by skin, leaving no residue, and it really moisturizes the skin all day. I also love the fact that Red Flower is animal friendly and environmentally kind. I need that Anastasia brow kit! Kebetulan waktu itu aku belinya dari drugstore.com - nitip sama adik iparku. Soalnya drugstore.com nggak bisa kirim ke international. Tapi kamu coba cari2 aja toko online yang buka PO untuk drugstore.com, kayanya banyak juga yg bisa buka PO dari sini.